Join us at the Wendell Gilley Museum for our Annual Holiday Open House and Carving Show! GRATITUDEWe are truly grateful for the support and participation of all our members and visitors - not only this year but ever since the Museum's doors first opened in 1981. You are what makes the Gilley possible.GIVINGYear-end charitable giving is a tradition in many households. Any donation you can make now to the Gilley's "nest egg" will be carefully tended and "hatched" into future exhibits and programs - assuring more gatherings and gratitude for many years to come. We ask that you keep the Gilley in your thoughts during this season of giving, and consider CLICKING HERE to give today. Donations are tax-deductible to the extent provided by law. The Gilley warmly welcomes you to our annual Holiday Open House and Carving Show. Flock around our Finnish Fireplace, refreshments in hand, to admire freshly fledged Tufted Titmice and other new works by members. We have a day for giving thanks. We have two days for getting deals. Now, we have #GivingTuesday, a day dedicated to giving back. 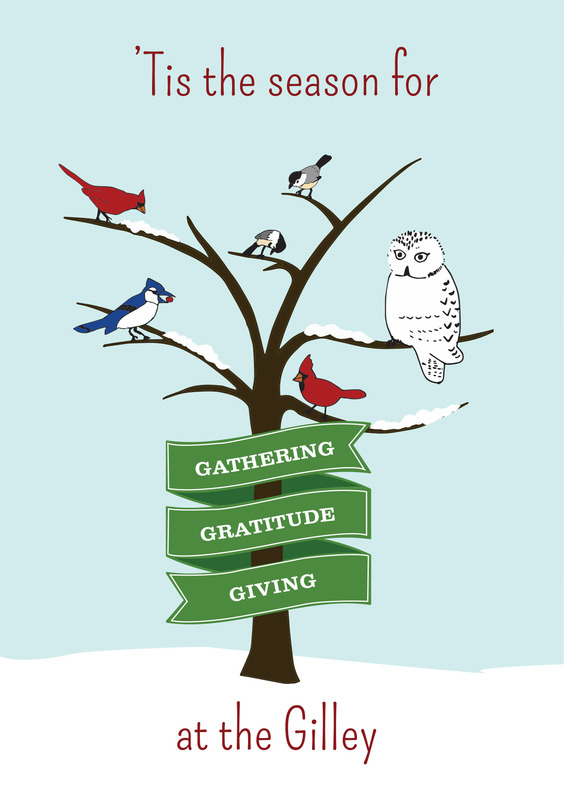 consider a year end contribution to Harbor House by clicking here. Our December vacation camp will run from December 29-January 2 for kids from kindergarten to 5th grade. Cost is $35 per day. For more information click here for the Camp flyer. 12:30 until 5:00. While costumes with a winter holiday theme are not required to attend, each year we have had some wonderfully creative outfits and prizes will be awarded in several categories. The party will also include special games, activities, and loads of treats. This is a time for everyone who has attended our after school programming to get together and have a good time before the Community holiday celebration. 3:00-7:00 pm Craft Fair. Local crafters will be selling beautiful gifts for the Holiday season in the Old Yellow Schoolhouse. 5:45-7pm Photos with Santa by Mary Ellen Martel at Harbor House. Refreshments and cookies will be offered by the Southwest Harbor Congregational Church. 4:30pm Contra Dance after the show at Pemetic. We will start our NEW Pre-K program for kids ages 4-5 (not yet in Kindergarten) on Saturday December 20th from 8-8:45am. Look for more information coming soon about this fun program! December Special: Buy a 3 month membership and get a fourth month for free! What a great Christmas gift to give someone or yourself. Let Harbor House Fitness help you stay on track during the holidays and stick to your resolutions! Keep yourself stress free during the holiday season with one of our great Yoga classes. We have lots to choose from with great offerings from MaryKate Murray, Phoebe Barnes, Machelle Lahaye and Meghan Witham. Treat yourself to some YOU time and check our brochure for class times and descriptions. November is here already and time to start thinking about this years Christmas Bird Count. I am being pro-active again this year because I will be leading another Cuban Bird Survey from December 1-14. You will not hear from me until I get back on Sunday December 14 so it would be good for me to have an understanding about who will be here and the area you’ll cover. This years CBC is on Saturday December 20. I would like to ask everyone to join in our efforts again this year. Those of you who have participated for many years know your locations and I trust that everyone will be participating again. For those of you that have not been involved, the MDI CBC could really use your help. If you could contact me I will assign you a location to bird. As of today, I do not know who would like to cover Sand beach to Otter Cove and Blackwoods. Bass Harbor folks should contact me as well. I am also hoping that the Seal Cove group has enough people and if not, I will find someone to help. Perhaps Rich McDonald can help you with this substantial section of MDI. I am reaching out to everyone so that we can maximize the talent we have. It would be helpful if you contacted me, especially if you will not be participating. Thank you very much and I can’t wait for this years CBC. We have a few "No school"
Cost is $25-$35 a day depending on if your child is enrolled in the program. Mary Ellen ~ 244-9824 ormaryellen@harborhousemdi.org. Community Campfire Coalition was started in 2008 by three island non-profits, Maine Sea Coast Mission, Harbor House and the Neighborhood House. The coalition's mission is to provide heating assistance to families in need on Mount Desert, Swan's and Cranberry Islands. The new Health and Fitness session began this Monday, November 3rd and runs throughDecember 28th. We have some exciting new classes for the late fall session. Zumba Tuesdays at 5:30 pm, LIFT(Low.Impact.Functional.Training) with Kristy Mondays and Wednesdays at 8:30 am, and Chi Gong Mondays and Thursdays at 11:00am. Jackie's Spin Fusion is starting back up Tuesdays and Thursday at 9:00am. We have something for everyone! Please check out our website, www.harborhousemdi.org, for the full schedule. November 24th .We will be leaving from the Main Street building at7:30am and returning at approximately 5:30pm. Cost is $15 per person to cover the cost of gas. Call Lisa at 244-9555 to reserve your spot. Come join the fun! Apparently it is not too early to think about snow days here at the Underground. There is a simple rule of thumb to help you know whether or not we will be open: if school is cancelled then the Underground will be closed as well. However, if school is let out early because of a weather event we will open up early to help give parents a little extra time to arrange pick-ups and home care for their children. In this situation we will try to close as soon as we can so that everyone, including Harbor House staff, can get home safely before the weather gets any worse. There are a few days coming up which we know for sure the Underground will be open. We will be open from 8:30 to 5:30, on Veteran's Day November 11th. We will also be open all day onNovember 24 & 25th. There is no charge for these days or advance registration required. Children are free to come for the whole day or any part of it - we will be here with activities to keep them busy and engaged! Soccer season ended just before the snows came, and thanks to a great crew of coaches and helpful parents the players showed tremendous growth in their individual skills and team play. Several changes in the way the season was organized received a lot of positive feedback and we are working to carry these changes over into the basketball season as well. Organizing players into consistent teams, having a set schedule of other teams to play, and finding volunteers to officiate games are all steps we plan to add to this year's program. Although the final details of the basketball season are being worked out as everyone's winter gym schedules take shape, there are some things we know already. Practices for all age levels will begin the first week of December, andSaturday games will begin on December 13th. There will be a seven game schedule of games which runs until February 7th. As soon as we can finalize the practice schedule we will send out more detailed information, but it is not too early to sign up for anyone who already knows their child plans to participate. Early sign ups help us plan ahead and are much appreciated. You can pick up a registration form at Harbor House or download one here. One change to the basketball program this year will be the absence of a pre-K option. Our youngest players must be kindergarteners. We are in the planning stages of developing a separate, age-appropriate option for pre-K children and apologize for any disappointments caused by this change. Acadia National Park officials will hold a public meeting to discuss possible fee increases in 2015. The current park entrance fees have remained unchanged since 2004. In response to a service-wide effort to standardize entrance fees, the National Park Service has updated the standard entrance fee rate schedule. The proposed increases in park entrance fees will allow park managers to invest in the improvements necessary to provide the best possible park experience for its visitors. Additional revenue will also enable the park staff to enhance visitor services in preparation for Acadia’s centennial celebration in 2016. Entrance fees are not charged to persons under 16 years of age or to holders of the America the Beautiful National Parks and Federal Recreational Senior, Access or Military Passes. These passes may be obtained at the Park. Similar to the park entrance fees, Acadia’s campground fees have not changed in over a decade. With the new Schoodic Woods Campground opening in the summer of 2015, the park completed a comparison of facilities, services, and rate structures to similar private and public campgrounds in the area. Using this same study, the park is proposing to increase the rates at Blackwoods and Seawall Campgrounds at this same time. Based on the comparable campgrounds in the vicinity of the Schoodic Peninsula and Mount Desert Island, the park arrived at the rates in the table below. Acadia National Park is a strong economic engine for the surrounding area. The NPS Natural Resource Stewardship and Science office conducted a study in 2012 showing more than 2.43 million park visitors contributed over $200 million in economic benefit for the communities surrounding the park. This spending supported 3,089 jobs in the local area related to tourism. “We invite the public to share their thoughts and comments at the public meeting or to send their comments to us if they can’t attend,” stated Superintendent Steele. A public meeting will be held on the second floor of the Bar Harbor Town Office at 6:00 PM on Wednesday, November 12th. Comments submitted by mail or email are welcome at any time; however, to be part of the evaluation for the proposal for the fee change they should be received no later than December 8, 2014. If you have any questions about the proposed changes to the entrance fee structure or campground fees, please contact Sarah Milligan, Acting Fee Business Manager, at (207) 288-8781. Save the date for our annual Community Halloween Party on Saturday, October 25th from 5:30-7:30 pm. Harbor House has partnered with the MDI Hospital to offer the Diabetes Prevention Program known as the "Lifestyle Change Program". This program consists of 16 weeks of one hour sessions followed by 4-6 months of one hour a month meetings. The goal of this program, with the help of Dieticians, Physical Therapists, Health Coaches and Personal Trainers is to aid participants in adopting a lifestyle of healthy eating and exercise that will keep you on the path of wellness and the prevention of Diabetes. This program starts onFriday, October 10th and meets weekly 1:00-2:00pmat Harbor House's Main Street building. Harbor House will be sponsoring travel basketball teams again this year. If you have a child in grades 3 through 6 who is interested in playing on a travel team, please contact Harbor House so we can determine the level of interest in this program. Call us at 244 - 3713. Happy Fall from the Children's Center! As always, it is a busy time here at the Center. Fall is bringing lots of outdoor exploration, observations of the changing season and a variety of science experiments. Space is currently available in our Busy Bee room (3's & 4's) and in our Dragonfly room (Pre-K), full or partial weeks. Our Ladybug Room (18-36 months) is currently full but we are accepting names for our waiting list,as we will have some Ladybugs moving into the Busy Bee room in January. If you would like to learn more about the Children's Center or would like to schedule a visit, call Mary Ellen at 244-9824. During the month of October, Children's Center families will be selling "Mixed Bag Design" products to raise money for the Center. The star products from Mixed Bags are reusable shopping bags of various sizes and designs. These bags are made from recycled materials, they are sturdy and stand up while you are filling them! You can order through a Children's Center family or staff (you pay no tax or shipping and HHCC earns 50% ) or you can order on line at http://www.mixedbagdesigns.com/Retail-Home?fundraiserid=322649(you pay tax & shipping and HHCC earns 40%). You are welcome to stop by the Center on Herrick Road to check out our display of samples. If you have questions, call 244-9824. There has been a significant change to the layout of the Youth Center this year. Mark and Crystal's former office has been converted into a "Quiet Zone" where kids can get away from the bustle and excitement of the game room for more focused activities. It is a place where they can read, work on homework, quietly use their personal electronics, or just collect their thoughts. It has quickly become a popular place and clearly filled an important need for the Underground. Besides providing a fun and comfortable place to hang out after school,the Underground also offers a variety of enrichment programs over the course of the year. One popular program that will be starting up again this week is Cafe Book. Cafe Book is a collaboration between the Underground and the Southwest Harbor Library that makes it convenient for students to get across the street and benefit from another valuable community resource. A librarian will pick participants up from the Underground on Wednesday afternoons at 3:30, then walk them over to the library, where they can enjoy a simple snack while reading, working on homework, listening to an audiobook, and using the computer or any of the many resources our library provides. Participants are walked back to the Underground by 5:00, or parents can pick their children up at the library. Parents, please remember that while participation in the Underground Youth center is totally free, we do ask that you fill out a new registration form each year. This ensures that our information is accurate and up to date.